A sixth-plate daguerreotype of an unknown militia soldier or state volunteer from the Mexican War period. The editor announces the availability of an index for volumes I-XII, and updates on museum expansions and preservation efforts. The letters to the editor include feedback about the kersey blue pants mentioned in the Green Mountain issue, applause for the Confederate issue (November-December 1991) and kudos for Greg Mast’s profiles of six North Carolina lieutenants (July-August 1991). A selection of photos from the book Eyewitness at Wounded Knee by Richard Jensen, Eli Paul and John Carter of the Nebraska State Historical Society includes various outdoor images from the Society’s collection. The year 1992 marks the 75th anniversary of America’s entry into World War I. Presented here is a sampling of images intended as an introduction to collectors who may be interested in exploring this period. A total of 17 photographs include a doughboy in full marching gear, an unidentified officer wearing a gas mask, Pvt. Roman L. Miller with a Browning Automatic Rifle, a soldier with a Hotchkiss Model 1914 machine gun, a cavalry trooper astride his mount and more. Two well-known two images of temporary bridges over Virginia’s Chickahominy River are the focus of this examination. 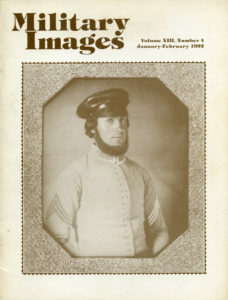 The photographs have been reproduced in numerous books and Ken Burns’ Civil War series. The author theorizes that the bridges are not separate structures, as has been long understood, but different views of the same bridge. Supporting observations lend credence to his claim. 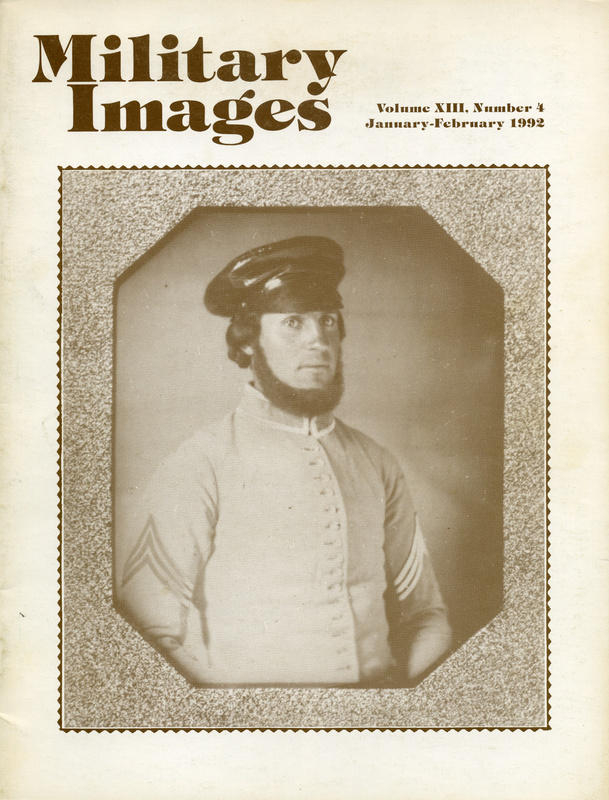 Profiles and photographs include Lt. Joseph Pierson of the 12th New Jersey Infantry, Capt. Hugh P. Boon of the 1st West Virginia Cavalry, Capt. George Brinkerhoff of the 135th New York Infantry, Capt. George Hazzard of the 4th U.S. Artillery and Lt. Charles DeRudio of the 79th New York Infantry, 2nd U.S. Colored Infantry and the 7th U.S. Cavalry. French-born Jean-Baptiste Victor Vifquain served briefly as a private in the 53rd New York Infantry before embarking on a unique adventure with two officers from the regiment—a plot to capture the Confederate president and commander-in-chief. The plan did not achieve its goal. Vifquain went on to become colonel of the 97th Illinois Infantry and receive the Medal of Honor for the capture of an enemy flag during the assault on Fort Blakely, Ala., on April 9, 1865. “Henry W. Barnes was a fellow with an eye for the ladies—and a penchant for marrying them.” Thus begins the sordid personal history of Barnes, or Henry Brown, as he became known, and his Civil War career as colonel of the 3rd New Jersey Infantry. In “14th Regiment, New York State Militia ‘14th Brooklyn’—84th New York Volunteers,” McAfee examines the origins of this respected regiment and its chasseur-inspired uniform. Portraits of Fred Tinker and Frederick Wright illustrate the narrative. Nine publications are mentioned, including Westward the Texans: The Civil War Journal of Pvt. William R. Howell (Texas Western Press) by Jerry D. Thompson, The Battle of Belmont: Grant Strikes South (The University of North Carolina Press) by Nathaniel Cheairs Hughes Jr., From Desert to Bayou: The Civil War Journal and Sketches of Morgan Wolfe Merrick (Texas Western Press) by Jerry D. Thompson, and more. Eleven other books, all reprints, are also mentioned. A single image, circa 1920, from the Rich Ricca Collection pictures Old Glory, Uncle Sam, Miss Liberty, nurses and soldiers representing many historical eras on a float for patriotic parade. A photo postcard from the Scott Whitcome collection pictures a doughboy’s kit, ready for inspection.